Tonight at 9PM EST/6PM PST, “JEK III Productions” presents a special two hour GBP edition of “The Pugilist KOrner”!! The exclusive presentation will feature Hall of Fame matchmaker and promoter Don “War a Week“ Chargin, WBO Junior Welterweight title challenger Chris Algieri, Golden Boy Promotions Junior Middleweight prospect Eddie Gomez, and newly signed GBP hopeful Keandre Gibson of St. Louis, Missouri. Starting off this evening’s important broadcast will be Hall of Fame Boxing legend, Don “War a Week“ Chargin. 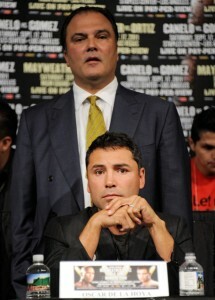 The “Don of Boxing” will be discussing many issues regarding Richard Schaefer’s recent departure from Golden Boy Promotions, as well as the potential impact of his resignation as CEO of the largest promotional organization in the sport. GBP’s senior advisor will also talk about the future of Oscar’s company, and the ripple effect it could have on the 2014 boxing calendar. Making his way back to “The Pugilist KOrner” will be undefeated WBO Junior Welterweight title challenger Chris Algieri (19-0, 8 KOs). The insightful prizefighter will discuss his June 14th championship bout with reigning title holder and murderous puncher Ruslan Provodnikov, which will be broadcast on HBO World Championship Boxing at Barclays Center in Brooklyn, New York. During the second hour of the program, undefeated and highly touted Golden Boy prospect Eddie Gomez (16-0, 10 KOs) will be our special guest. The “Bronx Bomber” will promote his upcoming ShoBox appearance against Francisco Santana, which will take place this Friday evening at the Fantasy Springs Resort & Casino in Indio, California. Closing out tonight’s show will be the ultra talented Junior Welterweight prospect Keandre Gibson (10-0, 5 KOs). The undefeated Golden Boy fighter will talk about his most recent victory, which took place last week on Fox Sports 1, as well as his future in the soon to be wide open 140 pound weight division.